Just like gridview, detailsview is also a databound control. Detailsview is used to display one row at a time. Let us understand a practical use of details view with an example. I have table tblEmployee with 10 columns. Use the sql script below to create and populate this table with sample data. 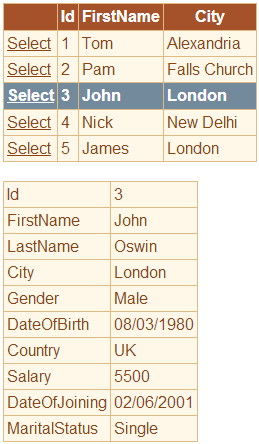 In a gridview control, I just want to show 3 columns (Id, FirstName and City) from tblEmployee table. As soon as I select a row, in the gridview control, then all the columns of the selected row, should be displayed in details view control as shown below. 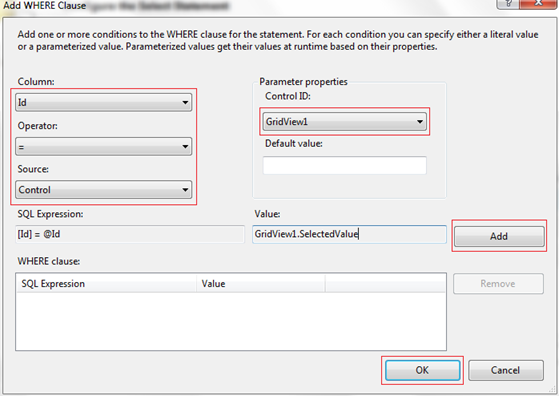 Step 5: Configure SqlDataSource2 to retrieve all columns from tblEmployee table. Add a WHERE clause to filter the rows based on the selected row in GridView1 control. At this point the HTML of your webform should be as shown below. Detailsview can also be used to perform insert, edit, and delete. We will discuss about these in a later video session.